For the first time in five years, the United Nations has admitted what epidemiologists, human-rights researchers, and the UN’s own experts established long ago: that its peacekeepers were responsible for the inadvertent introduction of cholera into Haiti in 2010, causing the deaths of over 10,000 people and sickening hundreds of thousands more. 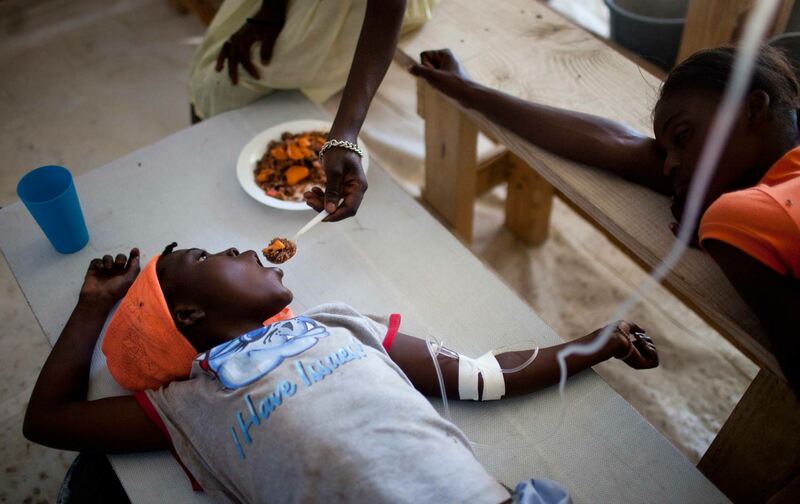 Cholera erupted in Haiti in October of 2010, less than a month after the arrival of UN peacekeepers from Nepal, which had just endured a major outbreak of the disease. The peacekeepers arrived at a UN outpost near Méyè, 40 kilometers northeast of Port-au-Prince, and were stationed at a base just a few meters away from a tributary to the Artibonite River, Haiti’s largest river and one of its main sources of water for drinking, cooking, and bathing. Although world-renowned epidemiologists have independently agreed that the outbreak was traceable to a specific cholera strain of South Asian origin found in Nepal, the United Nations has resisted the scientific evidence of their responsibility at every turn. This was not because of a difference of scientific opinion, but because of a fear of liability and a hope that the Haitian people’s demands for justice could be defeated through obfuscation and delay. Time and again, the United Nations pointed to Haiti’s poor water and sanitation infrastructure as the source of the problem—not so subtly suggesting that the Haitian people had brought cholera on themselves. Haitian victims and their advocates have called upon the United Nations to establish a claims commission for compensation since 2010, as the UN peacekeeper’s own status of forces agreement with Haiti requires it to do. But the organization has steadfastly refused, and when it was sued in federal court in New York by Haitian victims represented by the Institute for Justice and Democracy in Haiti, it claimed immunity from the suit. It is unclear what accounts for Secretary General Ban Ki Moon’s change of heart on the issue. Maybe it is the consistent political pressure that victims’ advocates have sustained, including a letter from 158 members of Congress to US Secretary of State Kerry in June, urging him to demand reparations from the UN. Or perhaps Ban Ki Moon has recognized, in the waning months of his tenure, that leaving the cholera catastrophe unaddressed would stain his legacy. Whatever the case, the United Nations is now poised to remediate the years of harm it has caused, to the Haitian people and to itself, and to affirmatively advance a framework of accountability for international governmental organizations. Third, the international community must commit to fund the compensation program promptly and adequately so that justice is not further delayed. Previous announcements of a cholera-elimination plan without the funding to back it have further eroded the United Nations’ weak standing in Haiti, and globally. Muneer I. AhmadTwitter Muneer I. Ahmad is a clinical professor of law at Yale Law School and director of the Transnational Development Clinic. He and his students are co-authors of the report Peacekeeping Without Accountability: The United Nations’ Responsibility for the Haitian Cholera Epidemic. Alice M. MillerAlice M. Miller is an assistant clinical professor of epidemiology at the Yale School of Public Health and co-director of the Global Health Justice Partnership of the Yale Law and Public Health Schools. She and her students are co-authors of the report Peacekeeping Without Accountability: The United Nations’ Responsibility for the Haitian Cholera Epidemic.